The proteinase-encoding prtB gene of Lactobacillus (Lb.) delbrueckii (d.) subsp. bulgaricus 92059 was cloned and sequenced. 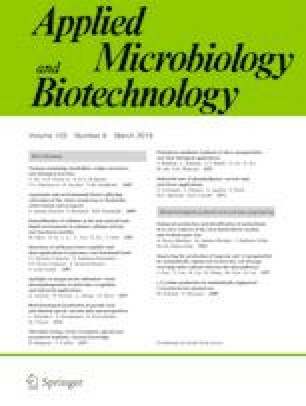 Two soluble, secreted, C-terminally His-tagged derivatives were constructed and expressed in Lactococcus lactis by means of the NICE® Expression System. In both obtained derivatives PrtBb and PrtB2, the C-terminal, cell wall-binding domain was deleted. In addition, in derivative PrtB2, the C-terminal part of the B domain was deleted and the signal sequence was replaced by a lactococcal export signal. The affinity-purified derivatives were both proteolytically active. Peptide hydrolysates produced from casein with each of the derivatives showed identical peptide composition, as determined by liquid chromatography–mass spectrometry. Comparison of the peptides generated to those generated with living Lb. d. subsp. bulgaricus 92059 cells (Kliche et al. Appl Microbiol Biotechnol 101:7621–7633, 2017) showed that β-casein was the casein fraction most susceptible to hydrolysis and that some significant differences were observed between the products obtained by either the derivatives or living Lb. d. subsp. bulgaricus 92059 cells. When tested for biological activity, the hydrolysate obtained with PrtBb showed 50% inhibition of angiotensin-converting enzyme at a concentration of 0.5 mg/ml and immunomodulation/anti-inflammation in an in vitro assay of TNF-α induced NFκB activation at concentrations of 5 and 2.5 mg/ml, respectively. The enzymatically obtained hydrolysate did not show any pro-inflammatory or cytotoxic activity. The online version of this article ( https://doi.org/10.1007/s00253-018-09586-x) contains supplementary material, which is available to authorized users. Expert technical assistance by G. Gerke, R. Miller, F. Repenning and M. Steinke is gratefully acknowledged. T. Koudelka and A. Tholey were supported by Deutsche Forschungsgemeinschaft (DFG), within SFB877, project Z2. The study was funded by the German Federal Ministry of Education and Research (Support Code 0315539B).